Pseudogout is an autoinflammatory condition triggered by calcium pyrophosphate dehydrate (CPPD) crystal deposition in the joints. The innate immune system is irritated by and responds to the presence of the crystals with an inflammatory response. The synovial fluid contains activated inflammatory macrophages and neutrophil granulocytes. Several details of crystal-induced macrophage activation were recently uncovered, but very little is known about interactions of CPPD crystals with neutrophils. In this study, we show that human neutrophils engulf CPPD crystals and form large amounts of neutrophil extracellular traps (NETs) in vitro. Released extracellular DNA binds myeloperoxidase and citrullinated histone H4. CPPD crystal–stimulated neutrophils and their nuclear DNA undergo morphological changes characteristic for NET formation. The ERK/MEK signaling pathway, heat shock protein 90, PI3K, and an intact cytoskeleton are required for CPPD-induced NET formation. Blocking crystal-activated respiratory burst has, however, no effect on NETs. Human neutrophils release IL-1β and IL-8 in response to CPPD crystals, and blocking CXCR2, the main IL-8R, diminishes NET formation. Proinflammatory cytokines, TNF-α, GM-CSF, and IL-1β, increase NET release by the crystals. Enhanced bacterial killing by CPPD-induced NETs demonstrates their ability to cause cellular damage. Our work documents and provides details about extracellular trap release in human neutrophils activated by CPPD microcrystals. We suggest that crystal-triggered NET formation can be a novel contributor to inflammatory conditions observed in CPPD crystal–driven synovitis. Calcium pyrophosphate dehydrate (CPPD) crystals deposited in joints of patients with pseudogout mechanically harm the joint surface and also trigger inflammatory responses resulting in pseudogout attacks (1, 2). Symptoms of gout and pseudogout are very similar. Gout is the most common autoinflammatory arthritis caused by accumulation of uric acid crystals (3). Definitive diagnosis of crystal-induced arthritis is provided by a direct examination of crystals in synovial fluid aspirates (4). Monosodium urate (MSU) crystals are needle-shaped and show strong negative birefringence, whereas CPPD crystals have no or weak positive birefringence and rhomboid shape (5–7). The major focus of therapy is to control the inflammatory response and to prevent later relapses (4). Glucocorticoids, nonsteroid anti-inflammatory drugs, and colchicine are used to treat crystal-induced arthritis (6). These treatments are less effective in pseudogout than in gout and do not prevent or abolish inflammation entirely (4, 6). Further research is required to better understand details of the inflammatory process in pseudogout and to develop more efficient anti-inflammatory therapies. The cause of crystal formation in pseudogout is poorly understood, but several hereditary conditions that affect phosphate and calcium metabolism are known risk factors (8). The synovial space of pseudogout and gout patients is characterized by recruitment of inflammatory cells, predominantly neutrophil granulocytes (9–12). Direct interaction between cells located in the synovial fluid and crystals have been shown. Calcium-containing crystals directly interact with and activate synovial fibroblasts and chondrocytes (13, 14). Recently, lots of attention was drawn to studies demonstrating inflammasome activation and IL-1β release in macrophages exposed to MSU or CPPD crystals (6, 15–17). These findings identified IL-1β as a central mediator and a novel therapeutic target of inflammation in crystal-induced joint diseases (18, 19). Anti–IL-1β Ab-based therapies have been successfully used to dampen joint inflammation in gout patients (20). MSU and CPPD crystals have also been shown to induce TNF-α expression in macrophages (21). Both secreted TNF-α and IL-1β attract neutrophils to the inflamed joints contributing to the inflammatory response (22). Despite the abundance and clinical importance of neutrophils in rheumatoid autoimmune diseases and in gout/pseudogout, only a few reports studied interactions of neutrophils with CPPD or MSU crystals (12, 23). CPPD crystals were shown to inhibit neutrophil apoptosis and extend neutrophil survival (24, 25). IL-1β secretion in GM-CSF– or TNF-α–treated neutrophils was also increased by CPPD crystals (10). Recently, formation of proinflammatory neutrophil extracellular traps (NETs) was detected in MSU crystal–exposed neutrophils and synovial cells obtained from gout patients (26, 27). It is, however, unclear whether a similar mechanism exists in pseudogout and whether CPPD crystals can also induce NET formation. In this study, we aimed at studying whether CPPD crystals stimulate NET formation in human neutrophils. We found robust release of extracellular DNA and myeloperoxidase (MPO) in neutrophils exposed to CPPD crystals. Citrullinated histones colocalized with extracellular DNA. Proinflammatory cytokines present in joints of pseudogout patients enhanced the NET-inducing effect of CPPD crystals. Our observations provide new insights into neutrophil activation in pseudogout. The human subject studies were anonymous and were conducted in accordance with the guidelines of the World Medical Association’s Declaration of Helsinki. Enrolled healthy volunteers signed informed consent forms. The human blood protocol (University of Georgia [UGA] no. 2012-10769-06) and the informed consent form were reviewed and approved by the Institutional Review Board of the UGA. Whole blood was drawn at the Health Center of the UGA, and coagulation was prevented with heparin. RBCs were removed by Dextran sedimentation (GE Healthcare). Leukocytes were washed in calcium- and magnesium-free PBS and layered on top of a five-phase Percoll gradient (65, 70, 75, 80, and 85%; Sigma). The 70-75-80% Percoll layers containing neutrophils were collected and washed in PBS. Pelleted neutrophils were stored in a 1:1 mix of autologous serum and RPMI 1640 medium (Life Technologies, Grand Island, NY) until use. Serum was isolated from 10 ml coagulated blood by centrifugation and sterile filtration (28). Before use, required number of neutrophils was washed twice in calcium-, magnesium-containing HBSS (Mediatech, Manassas, VA), and experiments were performed on neutrophils resuspended in HBSS without serum or albumin as assay buffer. The purity of the cells was determined by Wright–Giemsa staining or by flow cytometry (CD16+ CD66+, Miltenyi kits) and resulted in >95% neutrophils. Viability of the cells was determined by trypan blue dye extrusion and resulted in >98% viable neutrophils. CPPD crystals were purchased from Invivogen (San Diego, CA). The company synthesizes CPPD crystals in vitro from sodium nitrate and sodium pyrophosphate according to the protocol by Martinon et al. (15) Crystals produced by this method have been characterized by phase and polarizing microscopy (15). CPPD crystals were resuspended in HBSS at a concentration of 10 mg/ml. In addition, we also described the synthetic CPPD crystals used in our study, found them to be in the 2- to 15-μm size range and show rhomboid or elongated morphology (pictures were taken with a confocal microscope, Department of Infectious Diseases, Imaging Core Facility, UGA; Fig. 1A). Using polarizing microscopy, we confirmed that CPPD crystals showed weak positive birefringence (Fig. 1B). Crystal polarization was measured using an upright polarized light microscope with rotating stage and camera attached (Center for Advanced Ultrastructural Research, Department of Cell Biology, Barrow Hall, UGA). Positive birefringence was confirmed based on the blue crystal color when long axis of the crystal was parallel with the slow axis of the retardation plate (or a weak yellow color when the crystal orientation was perpendicular to the slow axis; Fig. 1B). Thus, size, shape, and optical features of the CPPD crystals used in our study were identical to those found in inflamed joints. A total of 100,000 neutrophils/well were allowed to adhere to 96-well black transparent-bottom plates in HBSS containing Sytox Orange (Life Technologies) membrane-impermeable DNA dye (final cc: 2.5 μM). When inhibitors were used, cells were pretreated for 10 min at 37°C. Neutrophils were stimulated by addition of CPPD crystals (0–250 μg/ml; Invivogen, San Diego, CA). Fluorescence (excitation: 530 nm; emission: 590 nm) was recorded in a fluorescence plate reader (Varioskan Ascent; Thermo Scientific) for up to 4 h (37°C). Fluorescence in samples containing neutrophils and 0.5 mg/ml saponin (Sigma, St. Louis, MO) was taken as maximal signal (100%). Relative fluorescence increase in unknown samples over the measurement time period was calculated and referred to as “extracellular DNA (% of max).” The following inhibitor concentrations were used: wortmannin (PI3K inhibitor, 100 nM; Sigma), SB225002 (CXCR2 antagonist, 10 μM; Sigma), cytochalasin-B (CB; actin polymerization inhibitor, 50 μM; Sigma), diphenylene iodonium (DPI; NADPH oxidase inhibitor, 10 μM; Sigma), radicicol (Hsp90 inhibitor, 50 μM; Sigma), U0126 (MEK1/2 inhibitor, 25 μM; Sigma). In priming experiments, the following cytokines were used: human GM-CSF (10 ng/ml; R&D Systems), human IL-1β (10 ng/ml; R&D Systems), and human TNF-α (10 ng/ml; R&D Systems). A total of 5 × 105 neutrophils/well were allowed to adhere to sterile 12-mm round glass coverslips (VWR International). Inhibitors were added and cells were incubated for 10 min at 37°C. CPPD crystals (50 μg/ml) were added; neutrophils were incubated for 3 h at 37°C and then fixed by 4% paraformaldehyde (Affymetrix, Cleveland, OH) for 10 min. Cells were permeabilized in 0.1% Triton X-100 (2 min; Sigma), washed three times in PBS, and blocked with PBS containing 5% goat serum (Jackson Immunoresearch, West Grove, PA) and 5% BSA (Hyclone Laboratories, South Logan, Utah) for 30 min 37°C. Neutrophils were incubated with monoclonal mouse anti-human MPO/FITC Ab (Clone MPO-7; 2 h, RT, dark, 1:1000; Dako) or polyclonal rabbit anti-histone H4 (citrulline 3) (1:1000; Millipore, Billerica, MA) and washed three times in PBS. After Alexa Fluor 594–labeled goat anti-rabbit secondary Ab was added (1 h, 1:1000; Molecular Probes), cells were stained with DAPI (2 min, at room temperature, 1:10000; Molecular Probes) and washed in PBS. Preparations were mounted with ProLong Antifade Kit (Molecular Probes, Grand Island, NY) following the manufacturer’s instructions and analyzed with either EVOS fluorescence microscope (AMG, Bothell, WA) or Zeiss AxioCam HRM fluorescence microscope with Axioplan2 imaging software. Nuclear morphology of neutrophils was assigned to four separate categories: lobulated, delobulated, diffuse NETs, and spread NETs according to typical morphological changes accompanying formation of NETs (29). At least a hundred neutrophils per field were counted and evaluated for nuclear morphology. Three nonoverlapping, independent fields of the immunofluorescence samples for each experimental condition (untreated, CPPD-treated) were evaluated. The experiments were repeated three times using neutrophils from different donors. Neutrophils (5 × 105) were allowed to adhere to 12-mm glass coverslips for 15 min in HBSS and stimulated by addition of 20 μg/ml CPPD crystals. After 30 min of incubation at 37°C, Sytox Green (5 μM) was added, and transmitted light and green fluorescent images of CPPD crystal–engulfing neutrophils were captured with EVOS fluorescent microscope. At least 10 different cells ingesting crystals have been recorded in 3 different donors’ neutrophil preparations. Human neutrophils were incubated with 100 μg/ml CPPD crystals in HBSS at 37°C. Phagocytosis of crystals was determined by measuring increase in side scatter by flow cytometry (27). After 30 min, cells were labeled with anti-human CD16-PE and anti-human CD66abce-allophycocyanin Abs (Miltenyi Biotec, Auburn, CA) according to the manufacturer’s instructions. Flow cytometry was performed on an LSR-II instrument using FACSDiva 6.0 software (BD Biosciences, San Jose, CA). Double-positive CD16+ CD66+ cells were evaluated in the CPPD-treated samples for percentage of cells with greater side scatter (pulse area) than the threshold value determined in the crystal-free sample (percent positive <1.0). Concentrations of human IL-8, IL-1β, and MPO in the supernatants of neutrophils were measured using commercial ELISA kits according to the manufacturer’s instructions: human IL-8 ELI-Pair ELISA kit (Cell Sciences, Canton, MA), human IL-1β (BioLegend, San Diego, CA), and human MPO (R&D Systems, Minneapolis, MN). A total of 5 × 105/well neutrophils were seeded in 24-well plates and stimulated with 50 μg/ml CPPD crystals in HBSS for up to 3 h at 37°C. Cell supernatants collected were either immediately processed or stored (−20°C) for later analysis. Undiluted supernatants were used to measure IL-8 and IL-1β levels, whereas supernatants were diluted 1:100 to determine MPO concentrations. Superoxide production in adherent neutrophils was measured by Diogenes superoxide chemiluminescence kit (National Diagnostics, Atlanta, GA). A total of 50,000 neutrophils/well were allowed to adhere to 96-well white plates (15 min, 37°C, HBSS). Cells were stimulated by addition of CPPD microcrystals (0–250 μg/ml), PMA (100 nM), or were left unstimulated. Chemiluminescence was measured by Varioskan Flash luminometer (Thermo Scientific, Logan, UT) for 60 min. Data are shown as kinetics of representative curves (relative luminescence units [RLUs]) or as summarized luminescence (sum RLU) integrated for the entire duration of the measurement. A total of 900,000 neutrophils/well were allowed to adhere to 24-well plates in HBSS+10 mM HEPES+0.1% human serum albumin (Sigma). After 20 min, cells were left undisturbed or stimulated with 100 nM PMA or 50 μg/ml CPPD crystals to induce NET formation. After 3 h, 20,000 CFU Staphylococcus aureus (gift from Dr. Steven Holland, National Institute of Allergy and Infectious Diseases, National Institutes of Health) (30) were added in the presence of 2 μM CB (to prevent phagocytosis and intracellular killing of bacteria). Plates were centrifuged (800 × g, 10 min) to spin bacteria on NETs and incubated for 60 min at 37°C. A total of 1 U/ml DNase1 (Sigma) was added (10 min) to destroy NETs and release bacteria. Samples were scraped and transferred into 1 ml cold HBSS. After short centrifugation (100 × g, 3 min) to remove neutrophil debris and crystals, supernatants were diluted 1:5 in Luria–Bertani broth bacterial growth medium and four 200-μl aliquots were transferred to sterile 96-well plate on ice. Samples with known concentrations of bacteria and bacterium-free negative controls were included as well. Once assembled, the plate was warmed up (37°C, 10 min), and bacterial growth was followed by measuring changes in absorption (600 nm) overnight (Eon Microplate Spectrophotometer; BioTek, Winooski, VT). Incubation times required to reach OD = 0.05 were determined. Numbers of surviving S. aureus bacteria were calculated by comparing incubation times of unknown samples with standards (31). Results were analyzed using Student t test for single measurements or one-way ANOVA with Tukey posttest for multiple comparisons. Each experiment was performed at least three times on independent occasions with neutrophils isolated from different donors. Statistically significant differences were considered at p < 0.05 (significant differences: *p < 0.05, **p < 0.01, ***p < 0.001). Although the neutrophil is a major inflammatory cell type found in inflamed joints of gout and pseudogout patients, little is known about interactions of neutrophils with CPPD crystals (26, 27, 32). CPPD crystals found in patients have typically rhomboid or elongated shape, and the majority are shorter than 10 μm (33). CPPD crystals used in our study show similar morphology, are in the same size range (Fig. 1A), and show weak positive birefringence (Fig. 1B). In this article, we show that adherent human neutrophils release extracellular DNA in response to CPPD crystals (Fig. 1C). Sytox Orange fluorescence detecting extracellular DNA exposure begins to increase 30 min after stimulation of neutrophils with the highest dose of CPPD crystals tested (250 μg/ml) (Fig. 1C). CPPD crystal–induced DNA release is dose dependent (% of maximal ± SEM, n = 4): 19.5 ± 4.7 (no crystals), 39.4 ± 4.9 (20 μg/ml), 55.7 ± 5.2 (50 μg/ml), 66.7 ± 5.1 (100 μg/ml), and 74.8 ± 6.7 (250 μg/ml; Fig. 1D). In comparison, PMA stimulation resulted in 45.8 ± 2.8%, whereas glucose oxidase resulted in 44.9 ± 11.2% extracellular DNA release (data not shown). CPPD crystals induce formation of NETs. (A) Differential interference contrast images of CPPD crystals show rhomboid or elongated morphology. Lengths of the crystals range 2–15 μm (confocal microscopy). (B) Polarizing microscopy confirms weak positive birefringence of CPPD crystals. Images were chosen to show two crystals in a perpendicular position to each other. Arrows indicate direction of the slow axis of the first-order retardation plate of the polarizing microscope. Original magnification ×1000. (C) Adherent human neutrophils (100,000/well) were stimulated by different amounts (0–250 μg/ml) of CPPD crystals in the presence of the membrane-impermeable DNA-binding dye, Sytox Orange. Increase in fluorescence indicative of DNA release was followed for 2 h. One representative measurement, n = 4. (D) Extracellular DNA release from adherent neutrophils in the presence of CPPD crystals was quantitated as increase in Sytox Orange fluorescence over 2 h-period of time relative to maximal fluorescence (total DNA release). Mean ± SEM, n = 4. (E) MPO release was measured by ELISA in adherent human neutrophils stimulated with different doses (0, 10, 50, 100 μg/ml) of CPPD crystals over time (0–3 h). Mean ± SEM of three independent experiments. (F) MPO and DNA colocalize in CPPD-induced NETs. Adherent human neutrophils were stimulated by 50 μg/ml CPPD crystals, 100 nM PMA, or were left unstimulated for 3 h. Localization of MPO was determined by immunofluorescence, and samples were counterstained with DAPI. Original magnification ×400. Representative images, n = 3. NETs are composed of neutrophil granule proteins and histones attached to extracellular DNA fibers (34, 35). Proofs for colocalization of extracellular DNA with neutrophil markers and histones are required to define a neutrophil activation mechanism as NET formation. We detected release of large amounts of MPO by ELISA upon exposure of neutrophils to CPPD crystals (Fig. 1E). Maximal MPO release (506.7 ± 43.8 ng/ml, mean ± SEM; n = 3) was achieved by using 100 μg/ml crystals at 2-h incubation time (Fig. 1E). In comparison, basal MPO release (no crystals) was 63.8 ± 22.5 ng/ml (n = 3; Fig. 1E). We detected exact colocalization of MPO with extracellular DNA (DAPI) in weblike extracellular structures of neutrophils exposed to CPPD crystals (Fig. 1F). Similar results were obtained in PMA-stimulated neutrophils, whereas untreated cells showed resting phenotype (Fig. 1F). In addition to neutrophil granule components, colocalization with histones is also a requirement for definition of NETs (35). Histone citrullination catalyzed by peptidylarginine deiminase 4 (PAD4) mediates NET formation and is required for NET-mediated antibacterial innate immunity in mice (36, 37). The arginine in position 3 of histone 4 is citrullinated by PAD4 during NET formation and is a sign of neutrophils undergoing NET formation, not necrosis or apoptosis (36). We therefore stained human neutrophils exposed to CPPD crystals with an Ab recognizing histone 4 citrullinated on residue 3 (H4cit3) and observed robust H4cit3 staining (Fig. 2A). The majority of neutrophils stained positive for H4cit3 in the CPPD- and PMA-stimulated samples, but only a few cells showed H4cit3 positivity in the untreated group (Fig. 2A). H4cit3 staining colocalized with DNA (DAPI) in NETosed cells (Fig. 2A merge). These data confirm that neutrophils undergo NETosis upon CPPD treatment. NETs induced by CPPD crystals contain citrullinated histone H4. (A) Immunofluorescence staining of adherent human neutrophils stimulated with 50 μg/ml CPPD crystals or 100 nM PMA for 3 h. Cells were stained with DAPI (blue) and anti-H4cit3 Ab (red). Original magnification ×200. One representative experiment, n = 3. (B) Neutrophils in four different stages of NET formation with characteristic nuclear morphologies (lobulated, delobulated, diffuse, and spread NETs) are collected and shown. Panels show merged images of neutrophils stained with anti-H4cit3 and counterstained with DAPI. Original magnification ×1200. (C) Percentages of adherent neutrophils belonging to the four different nuclear morphology groups are presented in unstimulated cells and in cells stimulated with 50 μg/ml CPPD crystals for 3 h. Average values obtained in three independent experiments using different neutrophil donors are presented. NET formation in vitro is accompanied by well-characterized morphological changes of the cells. Initially, the nucleus loses its lobular structure and becomes diffuse, the nuclear membrane disintegrates, and the cell loses its original integrity and releases NETs at the final stage (34, 35). Characteristic changes in nuclear shape allow distinction of four different stages of NETosis: lobulated nucleus (resting cells), delobulated nucleus, diffuse NETs, and spread NETs (29). We detected all four stages in CPPD-treated neutrophils (Fig. 2B). Citrullination of histone H4 was absent in resting cells, appeared in delobulated nuclei, showed a stronger staining in diffuse NETs, and entirely overlapped with DNA in spread NETs (Fig. 2B). To further characterize morphological changes during CPPD-induced NETosis, we quantitated percentages of neutrophils belonging to any of the four aforementioned categories in unstimulated and CPPD crystal–exposed cells. In the untreated sample, the majority of neutrophils (71.0 ± 0.6%) had lobulated nuclei, 26.3 ± 2.7% showed delobulated, 2.0 ± 0.9% diffuse nuclei, and only 0.7 ± 0.5% of cells formed NETs (mean ± SEM, n = 4; Fig. 2C). Upon exposure to CPPD crystals (50 μg/ml, 3 h), the vast majority of the cells produced NETs (76.8 ± 4.5%), a smaller proportion had delobulated (9.3 ± 3.1%) or diffuse nuclei (11.7 ± 1.2%), and only a few cells remained in the resting state (2.2 ± 0.7%; mean ± SEM, n = 4; Fig. 2C). Morphological changes occurring in neutrophils exposed to CPPD crystals are also indicative of NET formation. CPPD crystals have been detected inside of neutrophils in clinical synovial fluid samples of pseudogout patients (38). To investigate whether crystals are ingested by neutrophils, we exposed adherent neutrophils to 20 μg/ml CPPD crystals on microscope coverslips for 30 min, Sytox Green DNA-binding dye was added to the medium, and live cell imaging was performed using a fluorescent microscope. Several neutrophils ingested CPPD crystals (Fig. 3A). To quantitate crystal engulfment, we mixed neutrophils in suspension with 20 μg/ml CPPD crystals for 30 min, stained cells for CD16 and CD66 with fluorochrome-labeled Abs, and measured increase in side scatter upon exposure to crystals in the double-positive cell population (Fig. 3B). Side scatter of crystal-engulfing neutrophils increases due to higher scattering properties of the cells (27). Crystal exposure resulted in 16.9 ± 5.8% (mean ± SEM, n = 4) phagocytosing cells (Fig. 3C). Human neutrophils engulf CPPD crystals. (A) Adherent human neutrophils were exposed to 20 μg/ml CPPD crystals for 30 min, and nuclear DNA was stained with Sytox Green. Transmitted light and fluorescence images of crystal-phagocytosing cells were recorded. The cell border and location of the crystal are outlined by bright lines. Two representative neutrophils are shown. At least 10 cells of 3 different donors were recorded. Scale bar, 10 μm. (B) Neutrophil phagocytosis of CPPD crystals was assessed by flow cytometry. Neutrophils were incubated in suspension with 50 μg/ml CPPD crystals for 30 min, stained for CD16 and CD66abce, and double-positive cells were analyzed for increase in side scatter (SSC) as a sign of crystal ingestion. One representative result is shown (n = 4). (C) Percentages of CPPD microcrystal-phagocytosing neutrophils were calculated and analyzed among four independent experiments (mean ± SEM, n = 4). Student t test (C). *p < 0.05. NET formation stimulated by bacteria or PMA require reactive oxygen species (ROS) produced by the Nox2-based NADPH oxidase (28, 35, 39, 40). Treatment of neutrophils with the NADPH oxidase inhibitor DPI abolishes NET formation induced by bacteria or PMA (35, 39). Chronic granulomatous disease (CGD) patients lack a fully functional respiratory burst because of mutations in one of the subunits of the NADPH oxidase enzyme complex and suffer from recurrent fungal and bacterial infections (41). CGD neutrophils do not produce NETs in response to bacteria or PMA (28, 35). Therefore, we asked whether neutrophils respond to CPPD crystal exposure with superoxide production. Adherent human neutrophils reacted with robust superoxide production that lasted for >1 h (Fig. 4A). CPPD crystal–induced NADPH oxidase activation displayed dose dependence (Fig. 4A, 4B). DPI blocked CPPD-triggered superoxide production indicating that the NADPH oxidase is the ROS source (Fig. 4C). 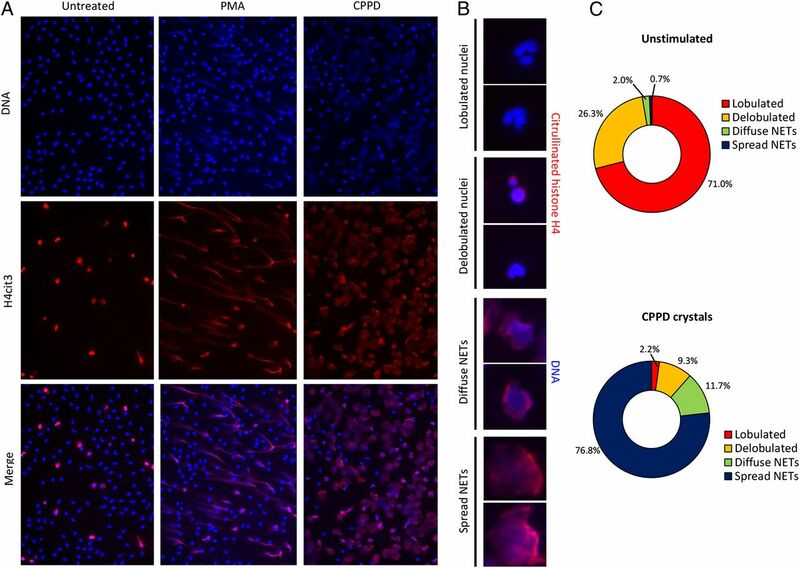 CPPD crystal–stimulated DNA release does not necessitate the respiratory burst in human neutrophils. Adherent human neutrophils were stimulated by different doses (0–100 μg/ml) of CPPD crystals, and ROS production was measured by Diogenes superoxide chemiluminescence kit for 1 h. Representative kinetics (A) and summarized superoxide production values (B, mean ± SEM; n = 4) are shown. (C) The NADPH oxidase inhibitor DPI (10 μM) blocks CPPD crystal–stimulated superoxide production (Diogenes, mean ± SEM, n = 4). DPI (10 μM) does not inhibit extracellular DNA release (Sytox Orange assay) in adherent neutrophils stimulated by CPPD crystals (100 μg/ml): representative kinetics (D) and summary of increases in extracellular DNA at 3 h (E) (mean ± SEM, n = 15). DPI blocks 100 nM PMA-stimulated NET release (E) (mean ± SEM, n = 5). One-way ANOVA/Tukey posttest. *p < 0.05, **p < 0.01. ns, nonsignificant; RFU, Relative fluorescence unit; summ, summarized. To determine the involvement of ROS production in NET release, we next treated neutrophils with DPI, challenged them with 50 μg/ml CPPD crystals, and measured release of extracellular DNA at 3 h poststimulation. Surprisingly, DPI treatment resulted in no significant inhibition of extracellular DNA release (Fig. 4D, 4E). Basal activity was 13.6 ± 2.2%, crystals induced 58.6 ± 7.1%, whereas DPI pretreatment led to 53.6 ± 6.2% DNA release (% of max, mean ± SEM; n = 15). Addition of extracellular scavengers of ROS (1500 U/ml catalase + 12.5 μg/ml superoxide dismutase) did not affect CPPD-induced NETs either (data not shown). When using PMA under the same conditions, we experienced a significant marked reduction in NET formation by DPI: basal (18.7 ± 3.2%), PMA (43.6 ± 1.6%), and PMA+DPI (22.3 ± 5.8%; mean ± SEM, n = 5; Fig. 4E). Exposure of adherent neutrophils to CPPD crystals typically leads to formation of neutrophil-crystal aggregates in our experiments (see transmitted light images: Figs. 1F, 5E). This suggests that migration of neutrophils also contributes to NETs. In addition to phagocytosis, cell migration requires active function of the actin cytoskeleton. To establish the importance of cytoskeletal changes in CPPD-induced NETs, we treated neutrophils with CB, an inhibitor of actin polymerization, before crystal addition (42). CB abolished (mean inhibitory effect: 96.5 ± 9.4%, n = 4) extracellular DNA release by CPPD crystals (Fig. 5A, 5B). On the other hand, CB had no effect on PMA-induced NETs (Fig. 5C). Activation of the NADPH oxidase by the crystals requires the cytoskeleton because CB blocked crystal-triggered superoxide production as well (Fig. 5D). MPO immunofluorescence staining revealed greatly reduced colocalization of MPO with DNA in NET structures (Fig. 5E). We conclude that an intact cytoskeleton is required for CPPD crystal–induced NETs. CB treatment inhibits NET formation by CPPD crystals. (A) Attached human neutrophils were pretreated with 50 μM CB (10 min) before addition of 50 μg/ml CPPD crystals. Extracellular DNA release was measured for 3 h in the presence of 5 μM Sytox Orange. One representative measurement is shown. Three other experiments gave similar data. (B) Quantitative analysis of extracellular DNA release (Sytox Orange assay, % of max) of adherent neutrophils induced by 50 μg/ml CPPD crystals in the presence or absence of 10 μM CB. Mean ± SEM, n = 4. (C) Extracellular DNA release quantitated in human neutrophils stimulated with 100 nM PMA in the presence of 50 μM CB. Mean ± SEM, n = 4. (D) CB abolishes CPPD crystal–triggered superoxide production (Diogenes) in neutrophils. Mean ± SEM, n = 5. (E) Representative immunofluorescence images of adherent neutrophils stimulated by 50 μg/ml CPPD crystals for 3 h with or without 50 μM CB pretreatment. Fixed and permeabilized cells were stained with FITC-labeled anti-MPO Ab (green) and DAPI (DNA, blue). Original magnification ×400. Three other donors gave similar results. One-way ANOVA/Tukey (B). **p < 0.01, ***p < 0.001. PI3K plays a crucial role in activating the neutrophil respiratory burst (43). PI3K signaling is an important regulator of autophagy (44). Autophagy has been linked to NET formation (26, 45). We exposed adherent human neutrophils to the PI3K inhibitor wortmannin before CPPD crystal addition, and measured NET release and superoxide production. Wortmannin treatment resulted in reduction (40.9 ± 12.3%, mean ± SEM; n = 4) in CPPD-induced DNA release (Fig. 6A) and in numbers of cells undergoing NETosis (Fig. 6B). Wortmannin caused complete block of CPPD-stimulated superoxide production (Fig. 6C). Additional DPI treatment did not enhance the inhibitory effect of wortmannin on CPPD-stimulated NET formation (Fig. 6A). We conclude that PI3K signaling is involved in CPPD-induced NET formation and superoxide production. Partial inhibition of CPPD-initiated release of NETs by wortmannin. (A) CPPD (50 μg/ml) crystal–induced extracellular DNA release (Sytox Orange, 3 h) is partially inhibited by pretreatment of human neutrophils with wortmannin (100 nM). DPI (10 μM) did not have any additional inhibitory effect (CPPD+wrtm+DPI). Mean ± SEM, n = 4. (B) Immunofluorescence images (MPO-FITC, DAPI [DNA]) of adherent neutrophils stimulated with 50 μg/ml CPPD crystals to form NETs with or without wortmannin pretreatment (100 nM, 15 min). Original magnification ×400. One representative image, n = 3. (C) Wortmannin (100 nM) blocks CPPD-stimulated (50 μg/ml) superoxide production in neutrophils (Diogenes, summarized luminescence for 1 h, mean ± SEM, n = 6). One-way ANOVA/Tukey posttest. *p < 0.05, **p < 0.01. summ, Summarized; wrtm, wortmannin. Heat shock proteins (Hsps) have been implicated in inflammasome signaling stimulated by gout crystals (46). Hsp90 inhibition was shown to inhibit NLRP3 inflammasome activation by crystals (46). No one has studied, however, whether Hsp90 has a role in NET formation. In this study, we treated neutrophils with the potent Hsp90 inhibitor radicicol and measured release of extracellular traps after CPPD stimulation (47, 48). Radicicol markedly reduced (76.5 ± 12.6% inhibitory effect, mean ± SEM, n = 4) release of extracellular DNA by CPPD crystals (Fig. 7A, 7B). Hsp90 also influences NADPH oxidase activity because radicicol inhibited CPPD-activated ROS production (Fig. 7E). Immunofluorescence staining of neutrophils revealed diminished NET formation, higher numbers of resting cells, and lower cell numbers with citrullinated histone H4 staining (Fig. 7D). Radicicol did not have significant inhibitory effects on PMA-triggered NET release (Fig. 7F). Hsp90 and ERK are required for CPPD crystal–induced NETs. (A) Extracellular DNA release was followed for 4 h (Sytox Orange microplate assay) in adherent human neutrophils exposed to 50 μg/ml CPPD crystals in the presence or absence of Hsp90 inhibitor radicicol (50 μM) or the ERK inhibitor U0126 (25 μM). Representative curves are shown. Three other experiments gave similar data. (B) Quantitation of radicicol’s inhibitory (50 μM) effect on CPPD-initiated NET release (Sytox Orange, 3 h). Mean ± SEM, n = 4. (C) Quantitation of U0126 inhibitory (25 μM) effect on CPPD-initiated NET release (Sytox Orange, 3 h). Mean ± SEM, n = 4. (D) Immunofluorescence H4cit3 staining and DAPI counterstaining detects reduced amounts of NETs in neutrophils stimulated with CPPD crystals (50 μg/ml, 3 h) in the presence of radicicol (50 μM) or U0126 (25 μM). One representative set of data (n = 3). Original magnification ×200. (E) Neutrophils were stimulated with 50 μg/ml CPPD crystals or 100 nM PMA in the presence of U0126 (25 μM) or radicicol (50 μM), and superoxide production (summarized luminescence) was measured for 1 h (Diogenes). Mean ± SEM, n = 3. (F) Effects of U0126 and radicicol on PMA-stimulated NET release. Mean ± SEM, n = 3. One-way ANOVA/Tukey posttest. **p < 0.01. RFU, Relative fluorescence unit; UT, untreated. Involvement of c-Raf–MEK–ERK signaling pathway has been implicated in PMA-stimulated NET formation (29). We tested the effect of the potent MEK1/2 inhibitor, U0126 on CPPD-induced NETs. We found that U0126 treatment significantly delayed NET formation by CPPD crystals (Fig. 7A) and inhibited extracellular DNA release (Fig. 7C). U0126-treated neutrophils had blocked superoxide production (Fig. 7D) and lower number of H4cit3+ cells, and the majority of nuclei showed delobulated but not spread NET morphology (Fig. 7E). U0126 significantly inhibited PMA-induced NET release (Fig. 7F). The synovial fluid of gout and pseudogout patients is characterized by an inflammatory environment with proinflammatory cytokines being present (12). CPPD crystals activate the NLRP3 inflammasome in macrophages, causing release of proinflammatory IL-1β (15). TNF-α and GM-CSF are known priming agents of neutrophil effector functions, and they have been shown to increase ROS production and degranulation of neutrophils exposed to CPPD crystals (49, 50). We asked, therefore, whether proinflammatory cytokine priming of neutrophils by TNF-α, IL-1β, or GM-CSF would affect CPPD-induced NET formation. Neutrophil pretreatment with any of these cytokines increased extracellular DNA release by CPPD crystals (Fig. 8A, 8B): TNF-α (63.4%), IL-1β (82.1%), and GM-CSF (59.3%; mean increase over unprimed, n = 8; Fig. 8B). We also detected increased IL-1β production by neutrophils upon CPPD crystal exposure (Fig. 8C). 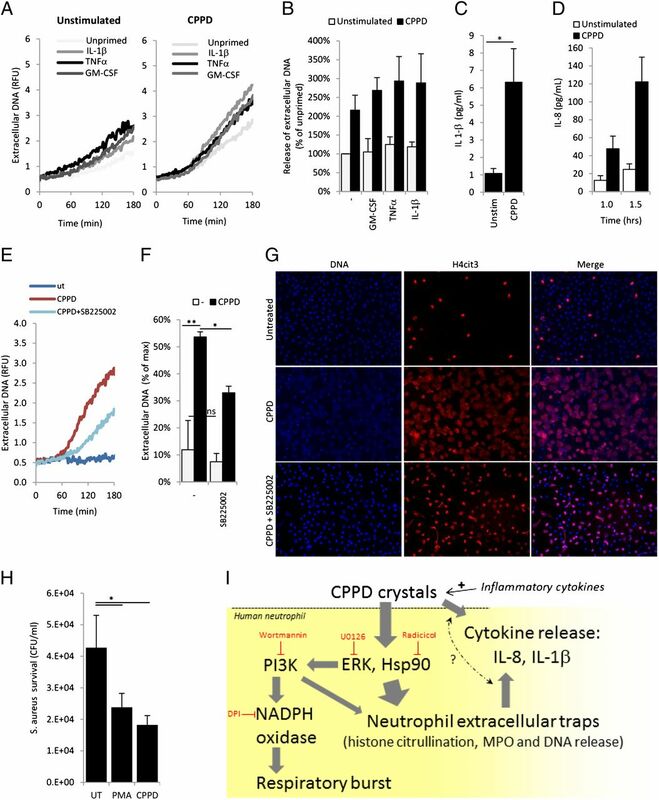 Inflammatory cytokines and enhanced NET-mediated bacterial killing link CPPD crystal–triggered neutrophil activation to inflammation. (A) Representative kinetics of extracellular DNA release data (Sytox Orange, 3 h) in adherent human neutrophils stimulated by CPPD microcrystals (20 μg/ml) after priming with proinflammatory cytokines (TNF-α, GM-CSF, IL-1β, 10 ng/ml, 3 h). (B) Extracellular DNA release was quantitated in neutrophils primed with cytokines (see A) and exposed to CPPD crystals for 3 h. Data are expressed relative to DNA release in the unprimed, CPPD-free sample (mean ± SEM, n = 8). (C) IL-1β release was measured by ELISA in neutrophils stimulated with 50 μg/ml CPPD crystals for 3 h. Mean ± SEM, n = 5. (D) IL-8 secretion was measured by sandwich ELISA in adherent human neutrophils stimulated with 50 μg/ml CPPD crystals for up to 1.5 h. Mean ± SEM, n = 4. (E) Extracellular DNA release was measured (Sytox Orange microplate assay) in neutrophils exposed to 50 μg/ml CPPD crystals in the presence or absence of CXCR2 inhibitor SB225002 (10 μM) for 3 h. One representative measurement (n = 4). (F) Quantitation of CXCR2 inhibitor’s (SB225002, 10 μM) effect on CPPD-initiated NET release (Sytox Orange, 3 h). Mean ± SEM, n = 4). (G) Immunofluorescence H4cit3 staining and DAPI counterstaining detects decreased NET formation in neutrophils stimulated with CPPD crystals (50 μg/ml, 3 h) in the presence of SB225002 (10 μM). One representative data set (n = 4). Original magnification ×200. (H) NET-mediated killing of S. aureus was measured in adherent neutrophils. NETs were stimulated by PMA (100 nM) or CPPD crystals (50 μg/ml), bacteria were added, and bacterial survival was assessed after 1-h incubation. Mean ± SEM, n = 5. (I) Proposed scheme summarizing neutrophil activation by CPPD crystals. Upon interaction with the crystals neutrophils release proinflammatory cytokines (IL-1β, IL-8), NETs (DNA, MPO), and produce superoxide. NET release requires ERK and Hsp90 activation, partial PI3K activity, but no NADPH oxidase. Proinflammatory cytokines (TNF-α, IL-1β, and GM-CSF) enhance CPPD-induced NETs. Student t test (C) or one-way ANOVA/Tukey posttest (F, H). *p < 0.05, **p < 0.01. RFU, Relative fluorescence unit; UT, untreated. CPPD crystals were shown to induce release of IL-8 from human neutrophils (11, 51). We also detected IL-8 production in neutrophils stimulated by CPPD crystals (Fig. 8D). IL-8 is a potent chemoattractant for neutrophils, and one of its main receptors is CXCR2 (52). To study whether IL-8 release and recruitment of neutrophils through CXCR2 binding plays a role in CPPD-induced NET formation, we exposed attached neutrophils to CPPD crystals in the presence of the specific CXCR2 inhibitor SB225002 (53). The inhibitor slowed down CPPD-induced extracellular DNA release and exhibited an inhibitory effect of 65.1% (mean, n = 5; Fig. 8E, 8F). Histone H4 citrullination was also diminished by SB225002 (Fig. 8G). To demonstrate that NETs released upon exposure to crystals cause damage to bystander cells, we measured NET-mediated bacterial killing. S. aureus has been shown to be killed by NETs efficiently in vitro (35). Adherent human neutrophils were first activated by PMA or CPPD crystals to form NETs (or left untreated), then exposed to S. aureus (in the presence of CB to inhibit phagocytosis), and bacterial survival was measured. PMA caused a 40.9 ± 3.8% decline in bacterial survival (compared with untreated), whereas CPPD crystals resulted in an even larger inhibition: 53.6 ± 7.0% (mean ± SEM, n = 5; Fig. 8H). These data indicate that NETs released by CPPD crystals can kill bacteria and provide a link to inflammation. NETs present an antimicrobial mechanism of neutrophil granulocytes to trap and kill microbes (34, 35, 54). Bacteria trigger NETs both in vitro and in vivo, and PAD4-deficient mice lacking neutrophils capable of producing NETs are more susceptible to bacterial challenge (34, 35, 37, 54, 55). NETs represent a major constituent of pus (56). Although NET formation is an essential early innate immune response, it has to be tightly controlled. Neutrophils that died by releasing NETs have to be removed quickly because long-term presence of released neutrophil components (extracellular DNA, histones, antimicrobial peptides, and proteins) can cause serious tissue damage and contribute to autoinflammatory diseases (56). Aberrant NET formation (or lack of timely removal of them) has already been associated with several diseases (56). Gout and pseudogout are both autoinflammatory conditions present in joint tissues caused by deposition of MSU or CPPD crystals (2). Both diseases are characterized by infiltration of phagocytic cells (macrophages, neutrophils) into the synovial fluid and by inflammatory conditions causing damage of joint tissues and periodical attacks (32). The pathophysiology of crystal-induced arthritis is not well understood. Macrophages were shown to ingest MSU and CPPD crystals, and to release proinflammatory cytokines (IL-1β, TNF-α), which contribute to maintenance of inflammatory conditions and recruit additional leukocytes (11, 15, 57). The NLRP3 inflammasome was shown to be activated upon crystal exposure of macrophages, resulting in secretion of the proinflammatory cytokine IL-1β (15, 57). Little is known, however, about the interactions of MSU or CPPD crystals with neutrophils, the major cell type present in synovial fluid of gout and pseudogout patients (12). Neutrophils interact with MSU and CPPD crystals, and respond with respiratory burst and cytokine release (10, 49). However, the fate of neutrophils after crystal exposure is unknown. Recently, two reports showed that neutrophils form NETs upon exposure to MSU crystals in vitro (26, 27). NETs were also detected in synovial fluid samples of gout patients (26). We studied whether CPPD crystal exposure promotes NET formation in human neutrophils in vitro and to gain insight into its mechanism. Under our experimental conditions, no or only minimal (<20% of maximal extracellular DNA release) spontaneous/nonspecific cell activation was observed (Figs. 1C–F, 2A, 4–7, 8A–F), whereas neutrophils responded with release of large amounts of extracellular DNA (50–90% of maximal extracellular DNA release) to CPPD crystals (Figs. 1C, 1D, 4D, 4E, 5A–C, 6A, 7A–C, 8E, 8F). This response is quick, faster than that observed with the maximal NET inducer, protein kinase C activator PMA (increase in PMA-stimulated extracellular DNA levels appears 60–90 min after stimulation) (35). The CPPD crystal dose range (0–250 μg/ml) used in our work is lower than the ones used in previous CPPD-neutrophil studies (10, 24, 25, 49). MSU crystals were shown to induce NETs in this exact same range (26, 27). We show that CPPD crystals lead to NET formation in neutrophils (colocalization of MPO and DNA, histone citrullination, and changes in nuclear morphology identical to PMA-stimulated cells; Figs. 1, 2) (29). Although very little is known about how neutrophils contribute in vivo to the inflammatory conditions present in joints of pseudogout patients, our data propose NET formation triggered by CPPD crystals to be present in the synovial fluid. Unnecessary NET release could contribute to the pathogenesis of pseudogout, similarly to other already known diseases like cystic fibrosis, pre-eclampsia, or periodontitis (56). Release of MPO and other neutrophil components could remain active in the synovial fluid, attack the joint surface (by producing ROS and releasing proteases), and recruit and activate additional inflammatory cells by worsening joint inflammation. To our knowledge, no data are available on MPO and histone levels in synovial fluid of CPPD crystal deposition disease patients. Neutrophils were shown to ingest MSU crystals, but crystal engulfment was proposed not to be a requirement for crystal-induced NET formation (27). CPPD crystals were shown inside of neutrophils in synovial fluid samples of joints in patients with CPPD-related arthropathy (58). Similarly to MSU crystals, our data show that neutrophils phagocytose CPPD crystals in vitro (Fig. 3) (27). CPPD-induced NETs were inhibited by the cytoskeletal inhibitor CB (Fig. 5). Because an intact cytoskeleton is required for both phagocytosis and migration, CB interferes with both processes and further studies are needed to answer the question whether crystal engulfment is a prerequisite for NETs. In contrast with a previous report, CB did not inhibit PMA-induced NETs in our hands (59). This discrepancy could be explained by the different drugs or stimuli used. NET formation by PMA and bacteria requires the neutrophil respiratory burst (35, 39). CGD neutrophils capable of producing no or only minor amounts of ROS do not form NETs in response to PMA and bacteria (35, 39, 41, 48). Previous reports have already indicated and we confirmed that CPPD crystals stimulate a robust respiratory burst in human neutrophils (Fig. 4A–C) (24, 49). To our surprise, we found that DPI had no significant effect on CPPD crystal–triggered extracellular DNA release in our hands (Fig. 4D, E). We repeated this experiment on neutrophils obtained from 15 different donors with a CPPD concentration (100 μg/ml) that triggers robust NET release and superoxide production. PMA-induced NET formation was severely diminished by DPI under our assay conditions (Fig. 4E, five donors). MSU crystal–induced NETs were shown to require ROS because antioxidant treatment reduced NETs detected by nonquantitative immunofluorescence (60). The two other reports that studied MSU crystal–stimulated NETs did not address the question of ROS involvement (26, 27). Although requirement of NADPH oxidase for NET formation in response to bacteria and PMA is well accepted, recent data show that NETs can also be induced in an NADPH oxidase–independent manner by the calcium ionophore, ionomycin, MIP-2, or platelet-activating factor (39, 61, 62). This supports that requirement of NADPH oxidase for NETs depends on the stimulus (39, 62). Our data also indicate that although ROS are not involved in CPPD-induced NETs, the robust respiratory burst stimulated by the crystals could expose the synovial fluid and joint surface to damage through oxidative attack. Autophagy and ROS generation were both suggested to be required for NET formation (45). PI3K is a known regulator of autophagy in neutrophils and its blocker, wortmannin, inhibits NET formation by PMA (45). PI3K is a known activator of the NADPH oxidase in neutrophils (63). PI3K signaling and autophagy have been both implicated in MSU crystal–induced NET formation (26). Pretreatment of CPPD-stimulated neutrophils with wortmannin resulted in partial inhibition of NET formation and block of superoxide generation in our hands (Fig. 6). Based on these results, we suggest that PI3K supports NET formation induced by CPPD crystals, similar to MSU crystals. PI3K acts possibly through induction of autophagy, but not via activation of the NADPH oxidase (Fig. 8I). Hsps help to protect the cell in stress situations. One of the most studied Hsps, Hsp90, has been implicated in inflammasome activation that also requires ROS (46). The role of Hsps in NET signaling has not been investigated before. We exposed neutrophils to Hsp90 inhibitor radicicol and observed marked inhibition in CPPD-induced NETs (Fig. 7). To our knowledge, our report is the first to indicate involvement of Hsps in NET signaling. Hsp90 stabilizes the NADPH oxidase complex during the respiratory burst (64, 65). Our data, however, did not indicate involvement of the NADPH oxidase in CPPD-induced NETs; therefore, Hsp90 must promote NET formation through a different mechanism that remains to be identified. We also observed the involvement of MEK-ERK signaling pathway in CPPD-stimulated NETs (Fig. 7). Previously, this pathway has already been implicated in NET formation triggered by PMA (29). Our data provide further evidence for the importance of this pathway in NET formation and support its general involvement in NET signaling independent of the type of stimulus (Fig. 8I). The synovial fluid in pseudogout is characterized by the presence of proinflammatory cytokines. Neutrophil priming by GM-CSF, IL-1β, and TNF-α all enhanced NET release by CPPD crystals (Fig. 8A, 8B). Neutrophils also released IL-1β in response to CPPD crystals. These data indicate that several inflammatory factors (microcrystals, cytokines) induce/enhance NET formation, and neutrophils themselves, in addition to macrophages, can contribute to the proinflammatory environment by cytokine release (Fig. 8C, 8D, 8I). We also tried to link neutrophil NETs to inflammatory action of macrophages by measuring IL-1β release in human macrophages (differentiated in vitro from blood-derived monocytes by M-CSF for 5–7 d) exposed to supernatants of neutrophils left untreated or stimulated with CPPD crystals, but found no significant effect (data not shown). When neutrophils were exposed to CPPD crystals, we typically observed several aggregates consisting of activated neutrophils and crystals (Figs. 1F, 6B). Similar aggregations of cells and crystals were reported when neutrophils were exposed to MSU crystals (27). This suggests that active cell migration is part of crystal-induced NET formation. Although inhibition of the cytoskeleton by CB affects multiple cellular functions, its remarkable inhibitory effect on NET formation is encouraging for future studies aimed at defining exact roles for migration and phagocytosis in crystal-induced neutrophil activation. Neutrophils produce large amounts of IL-8 in response to CPPD crystals, and CXCR2 block diminishes crystal-induced NETs (Fig. 8). IL-8 is a major neutrophil chemoattractant (66). CXCR2 is a main IL-8R in neutrophils (52). A role for IL-8 in CPPD crystal–induced inflammation has been shown (11). Our data also suggest that IL-8 release caused by CPPD crystal activation of neutrophils recruits additional cells (Fig. 8I). In an in vivo situation, this would mean a positive feedback mechanism of neutrophil recruitment and maintenance of the inflammatory situation. NETs produced in response to CPPD crystals are capable of killing bacteria (Fig. 8H). This demonstrates that CPPD-released NETs are not different from those induced by classical stimuli (PMA, bacteria) and can damage their environment. In a physiological setting, NETs could be harmful to bystander cells, mainly synoviocytes, and contribute to joint inflammation. In summary, our work presents for the first time, to our knowledge, robust NET release in response to CPPD inflammatory microcrystals. Neutrophils ingest CPPD crystals and respond with respiratory burst, MPO, DNA, IL-1β, and IL-8 release. Our work dissected its intracellular mechanism using inhibitors and found partial or full involvement of the cytoskeleton, PI3K, ERK, Hsp90, and CXCR2 in its progress. A potential link between NETs and CPPD-related arthropathy has not been established before. Our in vitro data suggest that NET release by CPPD crystals could have a role in amplification of the inflammatory response. Further studies are required to delineate the exact contribution of neutrophil activation to CPPD crystal–driven joint inflammation. We are grateful to James P. Barber and the UGA College of Veterinary Medicine Cytometry Core Facility for help with the flow cytometry measurements. We give special thanks to the UGA Health Center: Angela Standridge and Vickie Cromer for drawing blood from volunteers; and Adam Davis, Houston Taylor, and Dr. Ronald L. Forehand for help with the blood protocol, establishing the collaboration, and the continuous support for our research. We thank Dr. Biao He for providing access to the EVOS fluorescence microscope, Dr. John Schields for help with the polarizing microscope, and Dr. Barbara Reaves for help with the confocal microscope. This research was conducted at the Department of Infectious Diseases, College of Veterinary Medicine at the UGA. This work was supported by a startup fund for B.R. obtained from the Office of the Vice President for Research, University of Georgia (1026AR211001). Liu-Bryan, R., and F. Liote. 2005. Monosodium urate and calcium pyrophosphate dihydrate (CPPD) crystals, inflammation, and cellular signaling. Joint Bone Spine 72: 295–302. 2011. Crystals, inflammation, and osteoarthritis. Curr. Opin. Rheumatol. 23: 170–173. 2008. Developments in the scientific and clinical understanding of gout. Arthritis Res. Ther. 10: 221.
. 2012. Calcium pyrophosphate deposition disease: clinical manifestations. Reumatismo 63: 246–252.
. 2012. The diagnosis of calcium pyrophosphate dihydrate crystal deposition disease: the good, the bad and…ultrasonography! Reumatismo 64: 125–127. Macmullan, P., and G. McCarthy. 2012. Treatment and management of pseudogout: insights for the clinician. Ther. Adv. Musculoskelet Dis. 4: 121–131.
. 1999. Most calcium pyrophosphate crystals appear as non-birefringent. Ann. Rheum. Dis. 58: 582–584.
. 2007. Genetic factors in the pathogenesis of CPPD crystal deposition disease. Curr. Rheumatol. Rep. 9: 231–236.
. 2004. Central role of complement membrane attack complex in monosodium urate crystal-induced neutrophilic rabbit knee synovitis. Arthritis Rheum. 50: 2633–2639.
. 1994. Crystal-induced neutrophil activation. V. Differential production of biologically active IL-1 and IL-1 receptor antagonist. J. Immunol. 152: 5485–5494.
. 1995. Inflammatory microcrystals differentially regulate the secretion of macrophage inflammatory protein 1 and interleukin 8 by human neutrophils: a possible mechanism of neutrophil recruitment to sites of inflammation in synovitis. J. Exp. Med. 182: 2019–2025.
. 2010. Crystal-induced neutrophil activation. Immunol. Cell Biol. 88: 32–40.
. 2001. Basic calcium phosphate crystals activate human osteoarthritic synovial fibroblasts and induce matrix metalloproteinase-13 (collagenase-3) in adult porcine articular chondrocytes. Ann. Rheum. Dis. 60: 399–406.
. 2005. 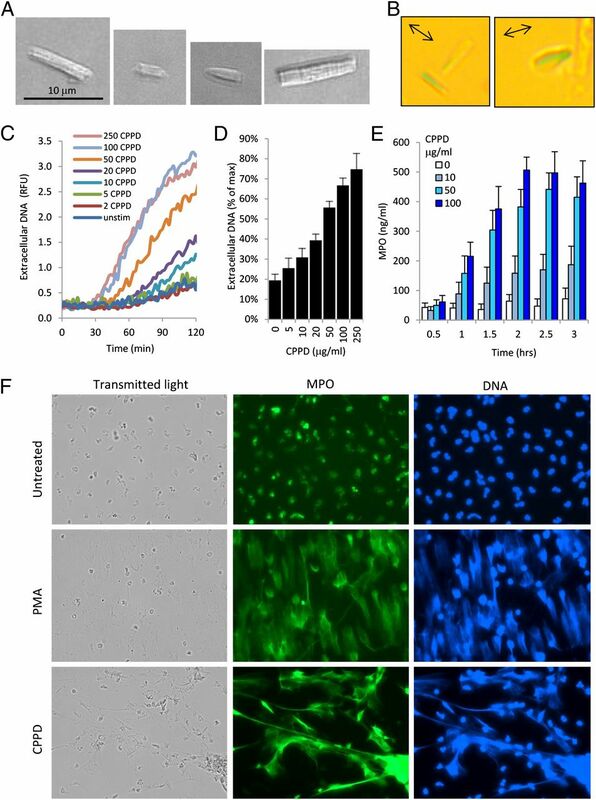 Octacalcium phosphate crystals directly stimulate expression of inducible nitric oxide synthase through p38 and JNK mitogen-activated protein kinases in articular chondrocytes. Arthritis Res. Ther. 7: R915–R926. Petrilli, V., and F. Martinon. 2007. The inflammasome, autoinflammatory diseases, and gout. Joint Bone Spine 74: 571–576.
. 2006. Gout: new insights into an old disease. J. Clin. Invest. 116: 2073–2075.
. 2010. Targeting IL-1beta in disease; the expanding role of NLRP3 inflammasome. Eur. J. Intern. Med. 21: 157–163.
. 2010. Sensors of the innate immune system: their link to rheumatic diseases. Nat. Rev. Rheumatol. 6: 146–156. Molto, A., and A. Olive. 2010. Anti-IL-1 molecules: new comers and new indications. Joint Bone Spine 77: 102–107.
. 1997. Monosodium urate, hydroxyapatite, and calcium pyrophosphate crystals induce tumor necrosis factor-alpha expression in a mononuclear cell line. J. Rheumatol. 24: 2385–2388.
. 2008. Neutrophil migration induced by IL-1beta depends upon LTB4 released by macrophages and upon TNF-alpha and IL-1beta released by mast cells. Inflammation 31: 36–46.
. 2012. The role of neutrophils in autoimmune diseases. Immunol. Lett. 143: 9–19.
. 2004. Calcium pyrophosphate dihydrate crystal associated induction of neutrophil activation and repression of TNF-alpha-induced apoptosis is mediated by the p38 MAP kinase. Cell. Signal. 16: 211–221. Higo, T., V. Duronio, C. Tudan, H. M. Burt, and J. K. Jackson. 2010. 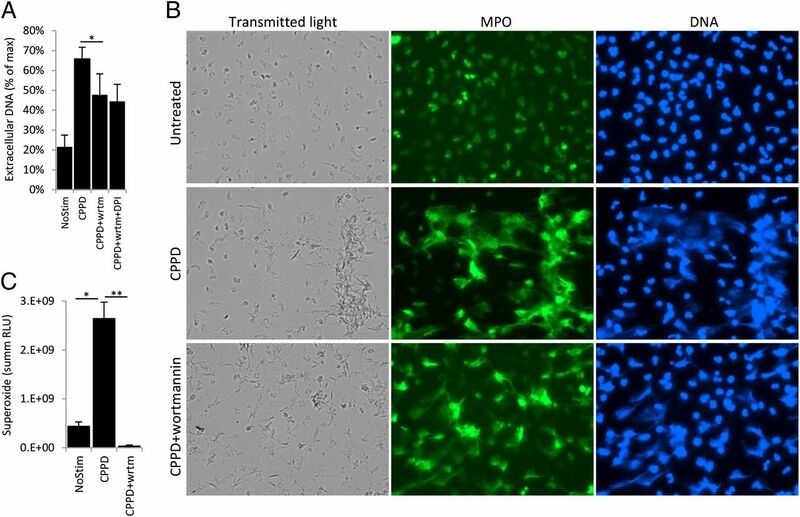 Calcium pyrophosphate dihydrate crystal-induced inhibition of neutrophil apoptosis: involvement of Bcl-2 family members. Inflamm. Res. 59: 71–81. Schorn, C., C. Janko, M. Latzko, R. Chaurio, G. Schett, and M. Herrmann. 2012. Monosodium urate crystals induce extracellular DNA traps in neutrophils, eosinophils, and basophils but not in mononuclear cells. Front. Immunol. 3: 277.
. 2013. 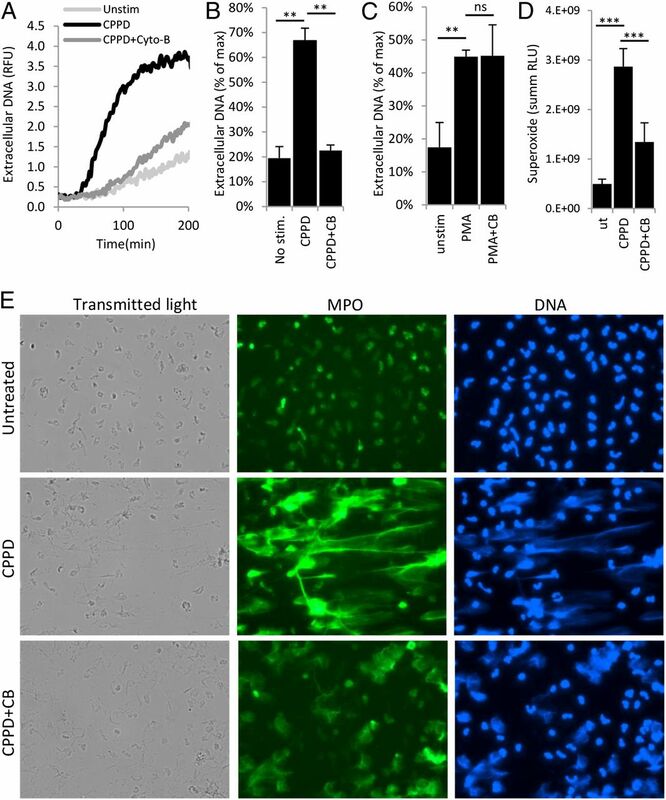 Pyocyanin-enhanced neutrophil extracellular trap formation requires the NADPH oxidase. PLoS ONE 8: e54205.
. 2010. Characterization of hydrogen peroxide production by Duox in bronchial epithelial cells exposed to Pseudomonas aeruginosa. FEBS Lett. 584: 917–922.
. 2004. Dual role of phagocytic NADPH oxidase in bacterial killing. Blood 104: 2947–2953.
. 2011. Crystal arthritis: calcium pyrophosphate deposition-nothing ‘pseudo’ about it! Nat Rev Rheumatol 7: 257–258.
. 1989. Calcium pyrophosphate and monosodium urate crystal interactions with neutrophils: effect of crystal size and lipoprotein binding to crystals. J. Rheumatol. 16: 809–817.
. 1975. Comparison of sodium urate and calcium pyrophosphate crystal phagocytosis by polymorphonuclear leukocytes. Effects of crystal size and other factors. Arthritis Rheum. 18(Suppl. 6): 783–792.
. 1985. Modifications in the phagocytosis of human neutrophils induced by vinblastine and cytochalasin B: the effects of lithium. Acta Haematol. 74: 81–85.
. 1998. Comparison of the roles of mitogen-activated protein kinase kinase and phosphatidylinositol 3-kinase signal transduction in neutrophil effector function. Biochem. J. 329: 121–130.
. 2005. Molecular mechanism and regulation of autophagy. Acta Pharmacol. Sin. 26: 1421–1434.
. 2007. A crucial function of SGT1 and HSP90 in inflammasome activity links mammalian and plant innate immune responses. Nat. Immunol. 8: 497–503.
. 2012. Radicicol, an Hsp90 inhibitor, inhibits intestinal inflammation and leakage in abdominal sepsis. J. Surg. Res. DOI: 10.1016/j.jss.2012.10.038.
. 2012. Heat shock protein 90 inhibitors reduce trafficking of ATP-gated P2X1 receptors and human platelet responsiveness. J. Biol. Chem. 287: 32747–32754.
. 1997. 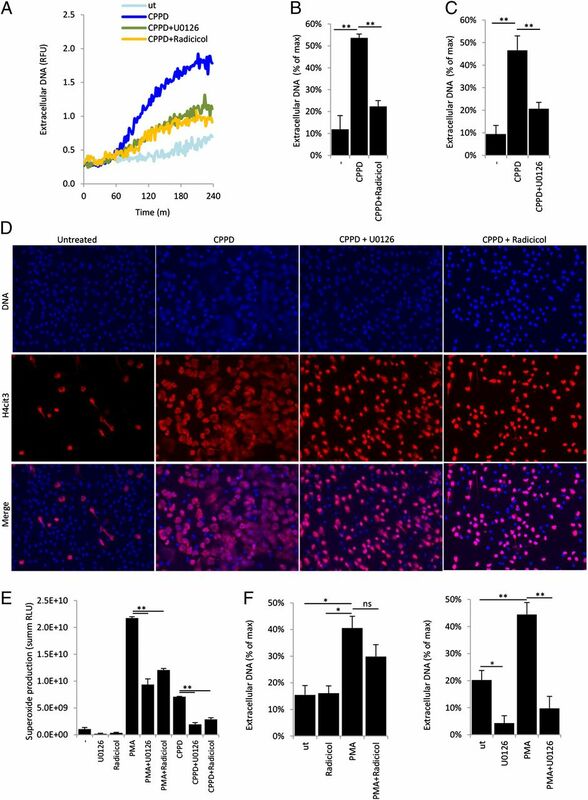 The priming action of tumour necrosis factor-alpha (TNF-alpha) and granulocyte-macrophage colony-stimulating factor (GM-CSF) on neutrophils activated by inflammatory microcrystals. Clin. Exp. Immunol. 108: 432–437.
. 2003. TNF-alpha induces phosphorylation of p47(phox) in human neutrophils: partial phosphorylation of p47phox is a common event of priming of human neutrophils by TNF-alpha and granulocyte-macrophage colony-stimulating factor. J. Immunol. 171: 4392–4398.
. 2000. Extracellular signal-regulated kinase 1/extracellular signal-regulated kinase 2 mitogen-activated protein kinase signaling and activation of activator protein 1 and nuclear factor kappaB transcription factors play central roles in interleukin-8 expression stimulated by monosodium urate monohydrate and calcium pyrophosphate crystals in monocytic cells. Arthritis Rheum. 43: 1145–1155.
. 2009. The functional significance behind expressing two IL-8 receptor types on PMN. J. Leukoc. Biol. 86: 529–543.
. 1998. Identification of a potent, selective non-peptide CXCR2 antagonist that inhibits interleukin-8-induced neutrophil migration. J. Biol. Chem. 273: 10095–10098.
. 2012. Infection-induced NETosis is a dynamic process involving neutrophil multitasking in vivo. Nat. Med. 18: 1386–1393. 2010. Mechanisms of uric acid crystal-mediated autoinflammation. Immunol. Rev. 233: 218–232.
. 2005. Intracellular and extracellular CPPD crystals are a regular feature in synovial fluid from uninflamed joints of patients with CPPD related arthropathy. Ann. Rheum. Dis. 64: 1769–1772. Schorn, C., C. Janko, V. Krenn, Y. Zhao, L. E. Munoz, G. Schett, and M. Herrmann. 2012. Bonding the foe - NETting neutrophils immobilize the pro-inflammatory monosodium urate crystals. Front. Immunol. 3: 376. Almyroudis, N. G., M. J. Grimm, B. A. Davidson, M. Rohm, C. F. Urban, and B. H. Segal. 2013. NETosis and NADPH oxidase: at the intersection of host defense, inflammation, and injury. Front. Immunol. 4: 45.
. 2004. Phosphoinositide 3-kinase regulates the phosphorylation of NADPH oxidase component p47(phox) by controlling cPKC/PKCdelta but not Akt. Biochem. Biophys. Res. Commun. 316: 720–730.
. 2012. Opposing actions of heat shock protein 90 and 70 regulate nicotinamide adenine dinucleotide phosphate oxidase stability and reactive oxygen species production. Arterioscler. Thromb. Vasc. Biol. 32: 2989–2999.
. 2011. Hsp90 regulates NADPH oxidase activity and is necessary for superoxide but not hydrogen peroxide production. Antioxid. Redox Signal. 14: 2107–2119. Kobayashi, Y. 2008. The role of chemokines in neutrophil biology. Front. Biosci. 13: 2400–2407.